To produce a clinical model for the prediction of myopia development based on the creation of percentile curves of axial length in school-aged children from Wuhan in central China. Data of 12,554 children (6054 girls and 6500 boys) were collected and analyzed for the generation of the axial length growth curves. A second data set with 226 children and three yearly successive measurements was used to verify the predictive power of the axial length growth percentile curves. Percentile curves were calculated for both gender groups and four age groups (6, 9, 12, and 15 years). The second data set was used to verify the efficacy of identifying the refractive error of the children using the axial length curves, based on their spherical refractive error from the third visit. From 6 to 15 years of age, all percentiles showed a growth trend in axial length, except for the percentiles below the first quartile, which appear to stabilize after the age of 12 (− 0.10; 95%CI, − 0.36–0.16; P = 0.23 for girls; − 0.16; 95%CI, − 0.70–0.39; P = 0.34 for boys); however, the growth continued for the remaining 75% of cases. The second data set showed that the likelihood of suffering high myopia (spherical refractive error ≤− 5.00D) during adolescent years increased when axial length values were above the first quartile, for both genders. The data from the current study provide a tool to observe the annual growth rates of axial length and can be considered as an approach to predict the refractive development at school ages. Understanding the refractive development of the visual system from birth is a key point in vision research, especially with regards to growing interest in understanding the origin and development of refractive errors, such as hyperopia and myopia. A typical refractive development of the visual system is characterized by a hyperopic refractive state (in terms of the spherical equivalent) at birth, which decreases as age increases . During the first 2 years of life, the most significant changes occur for the axial length of the eye and its corneal curvature, which determine the changes in the refractive state of the eye during the early years of childhood [2, 3]. At 6 years of age, the refractive of children in most populations is known to be leptokurtic, with a positively skewed distribution . With the increasing prevalence of myopia in East Asia, researchers describe a distribution with reduced leptokurtosis and a negative skew in that population . As myopia and especially high myopia (<− 5D) is known to have consequences for the health of the eye, as for example reviewed by Ikuno , myopia research has become more into the public focus. In order to decode the increasing prevalence of myopia, researchers have experimentally tried to explore the different theories about the onset and progression of myopia in animal studies . Epidemiological research has been carried out in order to better determine the risk factors that lead to myopic refractive errors. Among the parental history of refractive errors, the ethnicity, or the level of education, many more risk factors have been described in the literature [7, 8, 9, 10, 11, 12]. While different factors have been identified that influence the onset and development of progressive myopia, certain forms of stable myopia that are notable after birth have been described in the literature [13, 14]. Additionally, researchers have tried to develop models to predict the onset as well as the progression of myopia, based on different parameters, such as uncorrected visual acuity, axial length, corneal curvature, accommodative lag, AC/C ratio, and crystalline lens power [15, 16, 17, 18, 19]. To test and compare the children’s growth and development (from birth to juvenileness), pediatricians use percentile charts for variables such as weight, height, as well as body mass , and this statistical measure allows to assess and compare the growth of a variable in relation to a standard range. As far as the development of the visual system is concerned, these types of growth reference charts have only recently started to be used in ophthalmology [21, 22]. The purpose of this study was to produce a clinical estimation model for the prediction of myopia development, based on the creation of percentile curves of axial length for a large cohort of Chinese students in primary and secondary schools in the city of Wuhan. These percentiles will provide ranges of axial length values in order to understand the growth and the development of the visual system in the children and adolescent of Chinese populations. Data of 12,780 children were collected by the Wuhan Center for Adolescent Poor Vision Prevention and Control. The total data set was divided into two sets, one consisting of 12,554 children with individual data corresponding to a single visit and another set consisting of 226 children with longitudinal data. The first data set (12,554 children) was used for the development of the growth curves. This study cohort consisted of children from 5 to 16 years (mean spherical refractive error: − 0.91 ± 1.84D) divided into two groups based on gender. The two groups consisted of 6054 girls (mean age 9.99 ± 2.47 years, mean SR: − 0.93 ± 1.85D) and 6500 boys (mean age 9.90 ± 2.48 years, mean spherical refractive error: − 0.88 ± 1.83D). 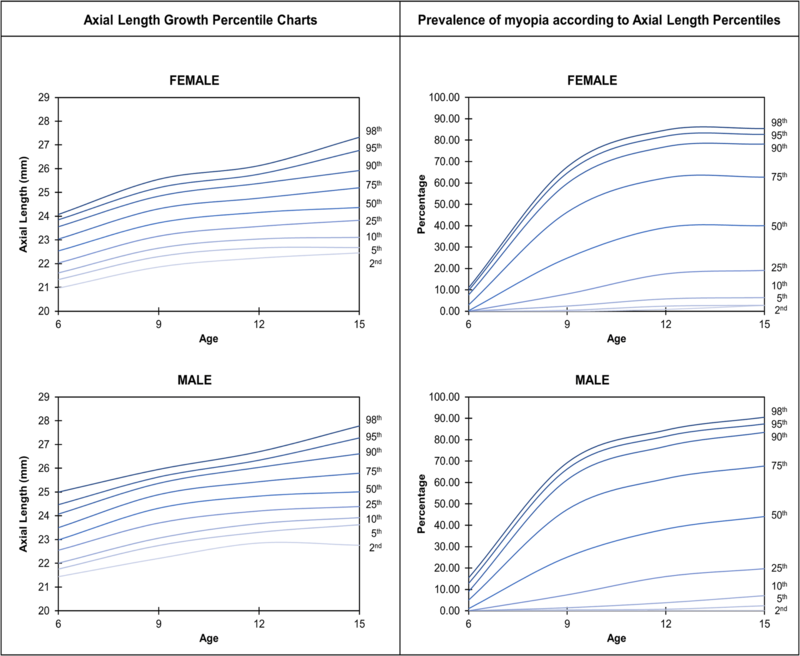 To validate the efficacy of the developed axial length growth percentile curves, the second data set (226 children) with three successive measurements of the same variables (Table 1) was used (average time between 1st and 3rd visit: 2.67 ± 2.96 years and 2.57 ± 2.77 years for girls and boys, respectively). The data set contained the age and gender of each subject as well as the following ocular parameters from both eyes: spherical refractive error (SR), axial length (AL), and corneal radius (CR). The measurement of the ocular parameters was accomplished using a non-invasive and non-contact biometer, Lenstar LS 900 SN 1914, V.1.1.0 (Haag-Streit AG, Koeniz, Switzerland) . AL was measured as the distance from the anterior corneal surface to the retinal pigment epithelium (RPE). CR was identified as the mean of the flattest and steepest radii. Moreover, the AL/CR ratio was calculated in order to obtain more information regarding the association between both variables. The autorefractor Topcon CV-3000 Compu Vision (Topcon, Tokyo, Japan) was used to measure the spherical refractive error. Measurements of the spherical refractive error were obtained under cycloplegia (4 drops of 0.5% Cyclopentolate, instilled at 5-min intervals), and three consecutive measurements of the spherical refraction were obtained after the full cycloplegic effect emerged (25 min after the last drop). The refractive state of the subjects was defined as myopia (SR ≤− 0.50D), emmetropia (− 0.50 < SR ≤+ 0.50D), hyperopia (SR >+ 0.50D), and high myopia (SR ≤− 5.00D). Only the data from the right eye was used for the final analysis. Statistical analysis was performed with the SPSS statistical software package, version 22.0 for Windows (SPSS, Chicago, Illinois, USA). Statistical analysis was accomplished in order to compare differences among gender and age groups. Analysis of variance (ANOVA) or Kruskal-Wallis tests were used depending on the distribution of the data. The least significant difference (LSD) test was used for the post hoc comparative analysis. Differences were considered statistically significant when the associated p value was less than 0.05. The 2nd, 5th, 10th, 25th, 50th, 75th, 90th, 95th, and 98th percentile curves were computed for AL taking into account both gender and different age groups. Receiver operating characteristic (ROC) analysis was carried out in order to obtain the diagnostic performance of the AL growth percentile curves, where an area of 1.0 represents an ideal test and an area of 0.5 denotes a worthless test. The prevalence of refractive errors, separated for the two genders, is shown in Table 2 and Table 3. It can be observed that at the age of 5 years, the prevalence of hyperopia was above 70.00% in both groups (80.67% for girls and 70.53% for boys), while the prevalence of myopia was lower than 10.00% (4.00% for girls and 6.32% for boys), and besides 13.30% of the girls and 23.16% of the boys were classified as emmetropic. With increasing age, the prevalence of hyperopia and myopia behaved in opposite ways. Between 7 and 8 years of age, myopia became the refractive state with the highest prevalence (56.56% girls and 54.56% boys), compared to prevalence of hyperopia (20.55% girls and 21.72% boys). In children aged 11 years, the prevalence of myopia exceeded 80.00% in both groups, while the prevalence additionally increased up to 87.93% for girls and 93.44% for boys, at the age of 16 years. Summarized, the SR was an age-dependent variable in both females and males (ANOVA, LSD post hoc, F = 234.216 P < 0.001, F = 228.614 P < 0.001, respectively), but not gender-dependent (P > 0.05 in each age group, Table 2 and Table 3). The mean values of the variables AL, CR, AL/CR ratio, and SR depending on the gender and age (from 5 to 16 years of age) are also shown in Table 2 and Table 3. Mean AL was 23.63 ± 1.11 mm in girls and 24.12 ± 1.14 mm in boys; mean CR was 7.75 ± 0.25 mm in girls and 7.87 ± 0.25 mm in boys; mean AL/CR ratio was 3.05 ± 0.13 mm in girls and 3.07 ± 0.13 mm in boys; and mean SR refraction was − 0.93 ± 1.85D in girls and − 0.88 ± 1.83D in boys. On average, the females in each age group had significantly shorter AL, steeper CR, and lower AL/CR ratios compared to the males in their respective age groups (P < 0.01, Table 2 and Table 3). A positive significant correlation between the SR and the CR (Pearson correlation = 0.027; covariance = 0.01; P = 0.001) was observed, while the correlation between the SR and the AL (Pearson correlation = − 0.768; covariance = − 1.63; P < 0.001) and between the SR and the AL/CR ratio (Pearson correlation = − 0.872; covariance = − 0.21; P < 0.001) was negative. The left part of Fig. 1 shows the growth percentile charts for AL, depending on the age and both genders. From 6 to 15 years of age, all of the percentiles showed a growth trend, except for the percentiles below the first quartile, which appear to stabilize after the age of 12. At this age and for this percentile, no statistical significant growth was observed (− 0.10; 95% CI, − 0.36 to 0.16; P = 0.23 for girls and − 0.16; 95% CI, − 0.70 to 0.39; P = 0.34 for boys). Specifically in the age group from 6 to 9 years, the AL variable of the lowest percentiles (2nd, 5th, and 10th) showed an increase in elongation that was greater than 0.89 mm for girls and 0.77 mm for boys. This behavior clearly attenuated with age and was less than 0.22 mm in girls and 0.32 mm in boys at the age of 12 years and onwards. From 6 to 15 years of age, the 50th percentile of the variable axial length increased by 1.83 mm for the girls (22.54 mm at 6 years of age and 24.37 mm at 15 years of age), while the 95th percentile increased by 2.92 mm in the same group (23.85 mm at 6 years of age and 26.77 mm at 15 years of age). In the boys group, the median increased by 2.02 mm (22.99 mm at 6 years of age and 25.01 mm at 15 years of age) and the 95th percentile increased by 2.81 mm (24.47 mm at 6 years of age and 27.28 mm at 15 years of age). The right part of the Fig. 1 expresses the myopia prevalence depending on the AL growth percentile curves, taking into account age and gender. For the two groups, the percentiles above the median for the AL showed values that exceed 50.00% of myopia prevalence. In the case of 90th, 95th, and 98th percentiles, this 50.00% was exceeded before the age of 9, reaching values greater than 75.00% from the age of 12 years and greater than 85.00% at the age of 15, as can be observed in 98th percentile (85.45% in girls and 90.55% in boys). The 75th percentile achieved values above 50.00% of myopia prevalence over 9 years of age, > 60.00% from age 12, which remains relatively stable until age 15. The median and the percentiles below it presented values that were below 25.00% of myopia prevalence at 9 years of age and reached percentages below 45.00% (40.00% in girls and 44.09% in boys) in adolescent stages, at 15 years of age. To verify the efficacy of identifying the refractive error of the children using the AL growth percentile curves, data from the 226 children with three measurements of the AL and other parameters were used. The baseline AL (at the first visit) was located on the AL growth percentile curves (Fig. 2) and the children were divided into hyperopes, emmetropes, myopes, and high myopes based on their SR at the third visit. In the female group, those children aged 9 years or older who developed high myopia in the last visit tended to be above the first quartile during their first visit. For this group, the ROC analysis for the cut-off value above the 25th percentile revealed an area under the curve greater than 0.85 (area: 0.876, standard error: 0.043; 95% CI, 0.791 to 0.962; P = 0.001), with a related sensitivity and specificity of 100.00% and 87.10%, respectively. For the group of male school children, high myopia developed in the majority of those children whose AL on the first visit was near to or above the 25th percentile. Again, the ROC analysis revealed an area under the curve greater than 0.75 (area: 0.781, standard error: 0.067; 95% CI, 0.650 to 0.913; P < 0.001), with a sensitivity and specificity of 89.50% and 86.10%, respectively. Different results could be observed, in case younger children are analyzed (age range 6–9 years). In this age range, the prevalence of myopia begins to have a more pronounced growth, as for example seen in the group of females. For them, the ROC analysis regarding the cut-off value above the 50th percentile revealed an area under the curve greater than 0.85 (area: 0.875, standard error: 0.053; 95% CI, 0.771 to 0.979; P = 0.013), with a related sensitivity and specificity of 100.00% and 71.90%, respectively. For the male group of the same age range, high myopia developed in the majority of those children where AL on the first visit was above the 50th percentile. Again, the ROC analysis revealed an area under the curve greater than 0.80 (area: 0.835, standard error: 0.080; 95% CI, 0.679 to 0.991; P < 0.001), with a sensitivity and specificity of 90.90% and 60.80%, respectively. The percentile growth curves of the AL were compared with the growth curves of the European children’s population published by Tideman et al. . As shown in Table 4, similar values were observed in the percentiles of both children cohorts for the AL at the age of 6 years, while there was a greater difference between these two populations in the percentiles of both children cohorts at the ages of 9 and 15 years, clearly indicating higher percentile values for the Chinese group for these two variables. As observed in the European children’s cohort , the 50th percentile of the AL variable was 22.06 mm for girls and 22.59 mm for boys at the age of 6, while similar results were found in our study population, 22.54 mm and 22.99 mm for females and males, respectively. At the age of 9 and 15, the differences became more noticeable. At 9 years of age, the 50th percentile showed values of 22.79 mm for girls and 23.31 mm for boys in the European population, while in the Chinese population, the values were 23.72 mm for girls and 24.32 mm for boys. At age 15, the European population showed values of the 50th percentile equal to 23.15 mm in the female group and 23.65 mm in the male group, while on the other hand in the our study population, the values were 24.37 mm in the female group and 25.01 mm in the male group. This paper showed what has been commented on the epidemic levels of myopia reached in areas of the Asian continent [24, 25]. The results showed prevalence’s of myopia above 12.00% at the age of 6 years, with a continuous progression from the age of 7 years, reaching prevalence levels close to 55.00% in both genders. These levels continue to grow visibly until reaching approximately 90.00% at teen years of age. Several studies have described the refractive error and ocular components of different groups of school-aged children depending on age, gender, or ethnicity [26, 27]. Asian ethnicity has been reported as the one with the greatest effect of age associated with a greater myopic spherical equivalent refractive error compared to other ethnic groups [26, 28]. As expected, the current study showed that a greater tendency of myopia with age was accompanied by the values of each of the variables analyzed in the Table 2 and Table 3. In terms of gender and age dependency, our findings were similar to those reported in other cohort studies [19, 22, 26, 28, 29, 30, 31, 32]. AL levels were lower in the female group compared to the male group. Although in both genders the CR remained stable with increasing age, flattest corneas were found in the male group. With regard to the AL/CR ratio, the findings were similar to those found in axial length with lower amounts of ratio in the female group. Fledelius et al. (2014) reported higher AL in the male group with mean values of 23.55 mm compared to 22.90 mm in females (0.65 mm mean difference), which began to be noticeable from 7 years of age, with a mean difference of 0.89 mm. These differences were attenuated with the increase in age, until the age of 20. Comparable results were described by Twelker et al. . They reported higher axial length values in the male group with a mean difference in axial length of 0.4 mm, which was reported as ethnically dependent and similar results were reported by Ip et al. . Moreover, both observed a stable behavior of corneal radius across age groups, reporting steepest corneas in the female group. He et al. reported statistical significant differences between boys and girls for the AL, the AL/CR ratio, and the spherical equivalent refractive error, while all of these variables were reported to be higher in boys. In opposition to He et al. 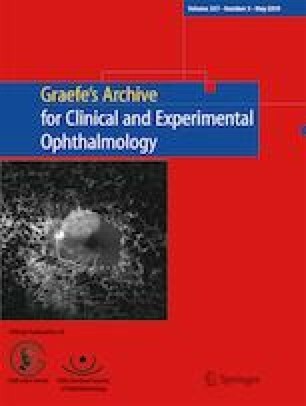 , no differences in spherical refractive error were associated with gender and the steepest corneal radius in the current study, for the female group. Regarding the AL/CR ratio, He et al. observed a mean value of 2.90 in school children at the age of 6 years, with a gradual increase to 3.03 at the age of 12. Similar values can be found in the current study in the case of the 6-year-old group, since for the 12-year-old group, values higher than 3.10 were reported. Due to the high correlation that was observed between the AL/CR ratio and the spherical equivalent refractive error , many studies have proposed the determination of optimal cut-off values in AL/CR ratio for myopia detection tasks [19, 34]. Both Grosvenor and Goss  and He et al. found very similar cutting values, > 2.99 and 3.00, respectively. The current study found similar cutoff points for the AL/CR ratio at the ages of 7 to 8 years, which was the age when myopia became the refractive state with the highest prevalence (Table 2 and Table 3). One of the latest methods used to estimate the risk of myopia development has been the use of growth percentile curves of different variables such as refraction, AL, CR, and AL/CR ratio [21, 22]. Chen et al. developed percentile curves of refraction based on data of 4218 children (age range: 5–15 years) collected from the “Guangzhou refractive error study”. They reported that children at young age with percentile refractive curves located below lower percentiles were more likely to have high myopia at 15 years or adulthood. Using axial length to develop growth curves (Fig. 2), it can be observed that for both genders, the age of 9 years is most important, since the probabilities of reaching high levels of myopia increases, when axial length values were located above the 50th percentile at this age. Furthermore, Tideman et al. generated a growth charts for AL, CR, and AL/CR ratio based on large epidemiological cohorts of European children and adults. On average, comparing with our growth percentile curves in Chinese children, European children, in both genders, showed lower percentile values, in AL and AL/CR ratio, from the age of 9 years. These differences are governed by all those environmental, genetic, and/or epigenetic factors that play a fundamental role in the refractive development of the human eye [9, 10, 11, 27]. Despite the importance of the results obtained, certain points must be taken into account. Nonhomogeneity of the sample size at each age of both genders may be one of the reasons why the prevalence levels of refractive states have abrupt changes from age 7 onwards. Moreover, given the importance of ethnicity in the development of the refractive state of the visual system, it is of great importance to make reference curves with populations of the same race. For this reason, the curves developed with the presented data may not be valid for children of other ethnicities. The results of the current study have to be taken with caution, when one is trying to translate the current findings to children of other ethnicities, age groups, or with different prevalence’s of myopia. It is quite clear that the development of such percentile curves pretty much depends on the quality and amount of data that is used for the development. Therefore, these curves will change for example in case the onset of myopia is shifted or the total prevalence of refractive errors is different. Nevertheless, these curves allow us to obtain standards to be able to individually monitor a specific subject and assess whether its axial length growth pattern is within or outside the limits of normal eye length variation and moreover, to have reference curves that allow us to compare with the rest of the ethnic groups and populations. The presented axial length percentile curves provide a simple method for estimating the probability of myopia in Chinese children’s populations, based on age, gender, and eye variables. This method can be the starting point for approaching and applying preventive treatments against the development of myopia at an early age with the aim to reduce the risk of developing high amounts of myopic refractive errors. European Union’s Horizon 2020 research and innovation programme under the Marie Skłodowska-Curie grant agreement (grant number 675137). This study was funded by European Union’s Horizon 2020 research and innovation programme under the Marie Skłodowska-Curie grant agreement (grant number 675137). The study was approved by the Ethical Committee of the Wuhan Center for Adolescent Poor Vision Prevention & Control. After explaining in detail all study procedures and before starting the study, all parents were carefully informed about study’s risks and benefits, and signed an informed consent in accordance with the Declaration of Helsinki (1964).